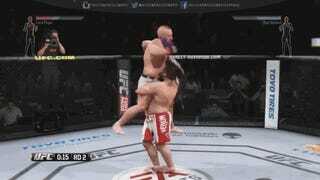 Even if you’ve never played EA’s UFC, or don’t care about MMA, you can still enjoy these glitches. The impressions of Joe Rogan and Mike Goldberg might not be as funny, but rest assured: they’re still wonderful and accurate. “This could be something new, Mike. Pettis is so creative. Look for him to have the cage attack Nate.” Fake Joe Rogan is the best.